I bought this tent last year for winter use. I've used it in the Adirondacks in down to -20°F (-29°C) nights. Heavy, especially because I use it as a 1-person tent. I will try not to mention too many of the things mentioned in the other reviews. I bought the tent exclusively for winter use in the Northeast. So far four hikes this year. I haven't used it in storm conditions yet, but I've tried to wake up in 1 foot of very heavy new snow. The temperature was just around freezing and the snow was extra heavy because of the melting water. The tent stood fine although sagging a bit, especially closer to the ground/ the edges, because of the weight of the snow. I woke up with the tent completely covered and I couldn't hear a sound. Then realized that the snow was blimping out all sounds. I shook the tent and the snow felt to the edges. Now I could hear that it was still snowing and the daylight penetrated the tent as well. I'm overall happy with the Staika. It's heavy for 1 person and I wish it was longer so my sleeping bag wouldn't touch the inside of the tent. During the night with the heavy snowfall, the snow prevented the tent from airing out and there was some condensation on the inside of the tent. All my other nights, I haven't had any problems with condensation as long as I leave all the air-vents fully open. That means that the temperature inside the tent is the same as the outside temperature. It's true that the top attachable mini-fly has to be de-attached and attached once the tent has been set. That takes extra time. When setting up the tent, I've been digging out snow. Normally around a foot. I've used MSR snow stakes for the 6 outer guidelines and haven't used stakes for the 6 loops at the edge of the tent. Normally the snow has been too powderish and I haven't be able to get a hold with the stake going straight down anyway. The MSR snow stakes used for the outer guidelines are buried down dead man style and that has world good so far. Especially considering the foot tall wall around the tent. On one outing I used the tent without the inner tent in order to save weight. That worked fine and I will do that at some of my future hikes again. When putting up the tent, there are a lot of lines that have to be straightened out while placing the tent on the ground. Not a big deal and it only takes a minute but its important that the poles are not inserted with a line on the wrong side of the pole. Still, its very quick and easy to put up the tent. I purchased the tent in 2013. The bathtub bottom is seam sealed but the corners that goes up on the side (6" or so) are not. I'm not worried as long as I'm only using the tent during the winter but I am going to seam seal the corners anyways. I think I would have been nice if they were sealed from the factory like the floor itself is. I haven't tried if water is penetrating. I'm also considering purchasing the Hilleberg Nammatj 2 since its 3lb. lighter and I it looks like I don't have to use stakes at the hooks at the edge of the tent if I just dig it down in the snow on the sides and then use stakes for the outer guidelines and the front and the back. 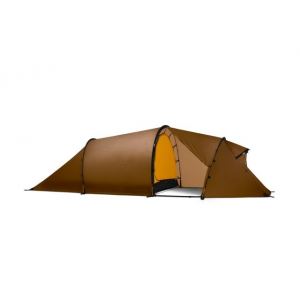 The Nammatj 2 would then be my 2-person tent in addition to the Staika and my Big Agnes Copper Spur 2. The Big Agnes is my lightweight 1-person summer/ fall tent for good weather (3lb 14oz). shell, poles winter stakes = 5lb. 15oz. shell, poles, stakes, inner tent = 8lb 11oz. 6 MSR winter stakes 6oz. Ease of Setup: Very easy. To put it in simple terms, this is the best tent I've ever seen for our needs. I have looked throughout the world at tent offerings, following even the faintest trails in search of an ideal shelter. The only tent I found that could hold a candle to the Staika was the Allak; another Hilleberg tent and essentially the lightweight version of the Staika with a couple of design deviations. 1) Very strong geodesic design. Utilizing 3 10mm poles of equal length. 2) *Completely* freestanding. It can be staked out (for really bad weather) but even the two vestibules are fully erected by the tent poles. 3) The entire tent goes up together. This keeps the inner tent dry even if the Staika is being erected in a downpour. 4) Long two-person inner tent body with two doors. 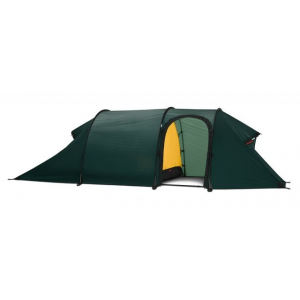 91" / 230cm long inner tent. 5) Fully adjustable venting through the tent body. Using no-seeum mesh/cloth panels that run overhead. 6) Plenty of storage area. Two large vestibules of equal size. 7) Venting right through the top of the tent body and rainfly, ***even in the rain***! 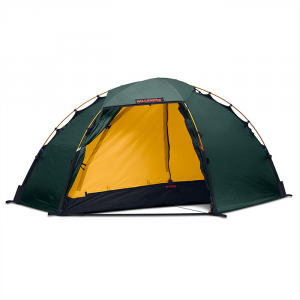 8) Directionally opposed doors allow for cross-flow circulation through the tent, regardless of if the wind is coming from the north, south, east or west. The lighter Allak lacks this feature, with both entries accessed from the same direction. 9) Incredible attention to detail and handmade by one person in Europe. 10) At under 8 pounds, the Staika is light given its size, heavy-duty construction and capabilities. 11) Great worldwide customer support by the family bearing the brand name themselves. We've owned the Staika since the summer of 2006. This tent has traveled with us through Europe and remote Alaska. It's been heavily used in all kinds of pitch locations and weathered many storms. Equally at home in all four seasons. It seems to have a lifetime of use left in it and we have no complaints. I've not been sponsored or been given a discount. I'd move onto something else if anything could beat the above list of design achievements. Not likely. What makes an initial good impression is this tent's free-standing quality and it's ability to be lifted and placed exactly where it needs to be for sleeping purposes. The 2 door vestibules are also part of the free-standing dome structure and therefore do not need to be staked out. As with nearly all Hillebergs, this tent has a suspended inner tent which is supported by the 3 poles clipped onto the outside of the silicone/Kerlon fly. Headroom is great and the interior space is perfect for one person. 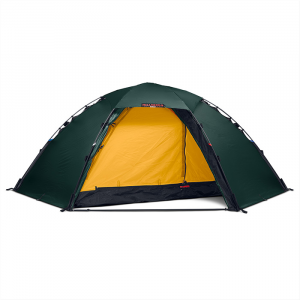 It is a big tent in some ways but in other ways it's total footprint is small and fits into most tent sites. The short pole sleeves and clip system is fast and strong. The golden yellow inner tent canopy is one of my favorite things about the Hilleberg line of tents and I like the bright interiors on cloudy days like today. Another big plus is the 100 denier 3-coated floor which almost feels rubbery and you just know it'll keep out the snow and rain. 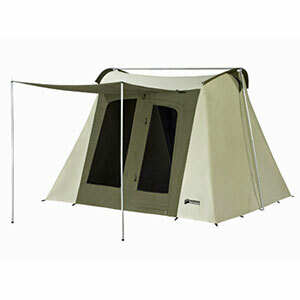 WEIGHT: This one attribute(along with price)is the main reason this tent is not carried and used by more backpackers. I don't mind carrying an 8 pound tent, in my mind it is light when you look at what you're getting: A large 2 door, 2 vestibule strong 3-poled four season self-standing high tech dome tent with 36 cubic feet of living space. This tent is a well thought out piece of gear built by people who have improved it with years of evolution and next-generation additions. Unlike many tents I could mention, Hilleberg finds something that works and instead of discontinuing it, improves it. 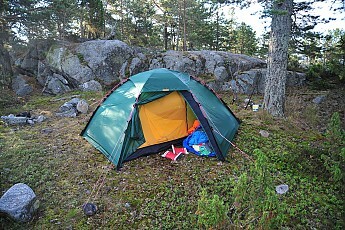 Here is a follow up report of the Hilleberg Staika after extensive use and many winter backpacking trips. 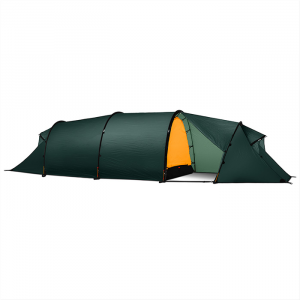 The main problem I found with this green dome 3 pole tent is the umbrella fly's attachment points. The fly connects to the tent using 6 plastic toggles which insert into 6 plastic rings, all beefy and strong. The toggle is connected to a short piece of webbing which is adjustable with a plastic ladder buckle. In warm weather this system works great, in ice-cold rain that freezes solid, this system is pitiful and nearly impossible to use. The webbing freezes stiff so the ladder buckle won't allow adjustment, that's one problem. The other is that the webbing behind the toggle won't bend enough to let the toggle pass out of the ring. It's all one big complicated mess. And as far as I can tell, the umbrella fly must detach in order to remove the poles from their short bottom sleeves in the process of taking down the tent. I emailed Hilleberg about this several weeks ago but have not gotten a reply. The only solution is to warm each point IN THE MOUTH to thaw enough to detach, or to use hot water in some way. I find such a problem to be ironic in a tent purported to be at home in the Arctic. I would be interested to see how the owners of other Hilleberg tents that use this system respond (Jannu/Saivo/Allak/Soulo). Don't get me wrong, this is still a great tent and I'll continue to use it wholeheartedly as my main shelter. Best winter alpine tent for my needs, used since 2005. Setup: Easy, in good weather once poles are erected, open doors to easier reach for center top clips. Stability: Superior even with only 6 guy lines fastened. Room and Storage: Sleeping space very good for two. Vestibules very easy access, less volume compared to tunnel tents. Conditions: Used in winter and summer in exposed terrain since 2005. I have a Staika (2005 model with clips on poles) and also an older version of Nallo 2. In the past I had a Keron 3 which I liked very much for winter trips. The Keron however, during a very heavy storm (more than 50m/sec while I was away from the tent) broke two of its poles and ripped pole sleeves due to a guy line stake loosening in the snow. Hilleberg offered very prompt and fair repair. Eventually I opted to sell my Keron (regret that now for sentimental reasons) and go for the Staika, which is a better base camp tent that can be left alone while on summit pushes etc. The Staika is not as roomy as the Keron, but good enough for two people in winter and ventilation is even better than the Keron. I have not however had such bad weather since as I had with that incidence with the Keron. Still, I hold the Staika for being very sturdy. I agree with prior reviewers that it is superior to the Allak due to opposing entrances and larger interior space. I actually bought an Allak at one point but returned it due to less internal volume and narrower at the feet end compared to the Staika. The Allak has a more modern design and if internal space is not an issue I could recommend it to anyone wanting a lighter version of the Staika. However, for me, it did not suit my needs and I returned it. I have never had any issues with leaking floors of my Hilleberg tents. I think when I bought my Keron I also received a tube of seam sealant to apply when new. Hilleberg floors are of a coating and material that doesn't lend itself to taping seams. They are instead more abrasion resistant and puncture proof and last better so a ground sheet really isn't necessary. This saves weight compared to tents that need an extra ground sheet. If my floor ever wears out, I trust Hilleberg will also replace it for a fair cost. So I wouldn't worry about a leaking floor, rather, if needed, just apply any seam sealant recommended by Hilleberg. The latest version of the Staika has (4) hooks and loops instead of toggles for the top vent cover. This is a huge improvement in the cold with mitts compared to the old small toggles on my Staika, so I have switched these out on my top vent cover. I would thus recommend getting one of the newer versions (if you are buying secondhand) or be prepared to change the toggles to hooks if opting for older version (actually I did this myself, a rather easy job, only top vent cover needs change). Welcome to Trailspace, Nicholas! Thanks for sharing your first review with us. Do you have any pictures of your Staika you'd be willing to show off in your review? Hilleberg has outstanding tents; I am glad that you have lots of extra money. High-end outdoor gear is not inexpensive but it is very nice in nearly all cases. Enjoy! The saga continues and I continue to be impressed with my Hilleberg Staika. The durability of the materials, fully free standing design, 36 square foot floor space, water pressure rating, zipper size, dual door and roof venting features, and the pitching feature of inner and outer tent together were the deciding factors. Any "four season tent- summer use ventilation hot tent concerns," the "leaking corner floor seam scare" and "damp sleeping bag at the foot end of the tent because it is too short" notions have been put to rest now that I have tested it in heavy rain, warm humid nights and below zero extremes. There were some close silicon/ nylon contenders including other Hilleberg options. Besides backpacking and car camping, it will be a motorcycle adventure tent as well. None considering the heavier materials are expected to weigh more than a smaller tent with less durable materials. What deterred me from the ultra lights and midrange tents despite their low weight, was the overall durability and, in the case of single walled options, condensation issues. Other deterrents were the non free standing pitching issues and the durability of/or lack of bug netting. The water absorption and resultant increased wet weight and over time delamination issues of a polyurethane coated tents were also concerns. Water pressure ratings are what they are; and, the higher the rating the more waterproof the tent will be, especially over time. Hammock options such as a Hennessy are not conducive to above timberline pitching but look like they would be handy on a steep, wooded mountain slope despite the other hammock oriented drawbacks. I personally need to stretch out truly flat with lots of leg room. The Hilleberg Black Label Tent's YKK zippers are heavy duty. I decided on the sand colored Staika this spring. In lieu of the one reviewer's story of pouring water into the inside of the tent and seeing it leak out, I did the precautionary seam sealing on the floor corner stitching and the center of the fly cap. The break-in was on my brick patio in Pennsylvania in early June. I set up for an anticipated record rainfall stormy night and throughout the following rainy day. I had the inner tent roof vents opened and the outer fly doors zipped down to their cap protected limit. I experimented with the inner tent venting options. I also did not use a footprint. I didn't sleep in it that night but routinely hung out and inspected it throughout my torture test. I did find that it is best to unzip the outer fly only up to 3/4 of the way up when entering the tent. This is enough to comfortably swing under the vestibule and open the inner tent without letting in the heavy rain. The brick patio tends not to pool any water. First night in the Santinoni area of the Adirondacks I pitched it about 150 yards off of the trailhead road in some rarely visited thick woods in warm muggy weather by a stream bed. I made a 3 mil plastic "full" footprint which stayed in place even though it is not clipped on. This tent has plenty of length: end to end, wall slope, and overhead room.There are over 6 inches of extra room at each end of my 4" x 78" x 25" pad. I am 5' 11". The slope of the inner tent is steep enough that the inner tent does not hang over my head nor feet. In terms of width, two people would still be very comfortable. The sand color blends extremely well into the woodland environment and the reflectors came in handy when searching for it at midnight after a post pitching trip to Long Lake for libations. Netting kept the mosquito hoards out and I had no condensation issues as I slept with the inner door solid panels unzipped/ door screens closed. I had the front fly flap open and top of the backside fly partially unzipped. The second night I pitched it in an unoccupied lean-to. It must of helped with the crawling insects as the lean-to had many active spider webs. Otherwise same kind of night (just a bit cooler) and no condensation or hot tent issues at all. There was a heavy fog in the morning but since the tent was in the lean-to I didn't have any dew to contend with. My full pack weight was 28 lbs. I wouldn't want to thru hike the A.T. with this rig although I have done sections of it with a 35-40 lb. pack. But for base camp setup and occasional above tree line destinations it is acceptable to me. I have made weight sacrifices elsewhere including a 70 liter 4.7 Lb. hauler, a 2.7 lb. bear canister which is required in the High Peak area, an extremely comfortable 2.4 lb. QCore pad, 1 lb. can of bear spray, 1.2 lb. first aid kit, a 3 lb. Feathered Friends rectangular (thank God) sleeping bag, Osprey 1.7 lb. day pack, and a full size Buck knife. I also packed my Trangia stove, which again is worth the extra weight to me since it eliminates the possibility of knocking my meal off the burner. The Staika and the confidence I now have for it is well worth the extra 4lbs. of tent to me. August will be the next opportunity for a two night'er. The bugs should be minimal by that time and the temperatures very cool at night, But no matter what the weather brings I can confidently say: "Bring It On!" August: Whiteface and Esther Trail HeadL Humid and a wicked wind!. I pitched the tent about 150" off the trailhead after arriving around 10:00 PM. Only worry that night was having the trees crash onto the tent. The rain didn't start until the afternoon while descending the 8 mile Whiteface highway in the hurricane force wind and rain, which was pretty much like walking through a carwash with a poncho on. Since a Bed and Breakfast in Keene Valley were on that's night agenda..Staika didn't have to submit to any rain this time and I had packed it in the car before I started out that morning. September: Two nights in the Seward Range Trailhead of the Adirondacks. The first night the temp was in the 50's with a light drizzle and heavy fog. I was in the closest tent site about a 1/2 mile from the trailhead parking lot. The next closest individuals were 6 miles away at the head of the access road toward the Saranac Lake Highway. I was dry and condensation free and glad I had two relatively sturdy walls and heavier frame between me and whatever may have been lurking in the fog, especially since it was earlier that week that a bear had stepped onto a woman's tent, compressed it on her back, and held it there for a few seconds while she was sleeping at the Marcy Dam area. Saturday, while climbing Seward, Donaldson, and Emmons, the weather changed to extreme soaking rain, major temperature drop, and and fog. After 18 soaking exhaustive miles and passing up Simmons for a later date, I hobbled back to the deserted trailhead and the Murano's heater and peeled out of my soaked gear. I then made the short drive back to the tent. No one stole it and, yes, I was worried. I somehow mustered up enough energy to huddle under the back hatch of the Murano and cook hot soup as the darkness set in. I would have loved to try cooking in the vestibule; but, the Adirondacks is one place you do not want to cook in a tent! Staika had now had over 24 hours continuous and that day extreme precipitation. Yet, I found myself back in the heavenly environment of my Feathered Friends Condor and a DRY interior. I did notice how effective my DIY full ground cloth was, as it was condensation soaked underneath yet the inner tent including the underside of the tent floor was completely dry. I once again lit my 6-hour candle lantern and placed it in the vestibule, left the candle side inner door half open, and happily read a chapter of a great book on Adirondack history and slipped into much needed sleep to the sound of rain on the tent walls and the glow of the candle.. The Sunday morning temperature was around 35 degrees, but the rain had subsided. I took advantage of being able to detach the dry inner tent threw it in the back of the Murano with the sleeping bag and pad without worrying about trashing it back there. I then was able to pack the wet ground cloth and outer tent in a trash bag. This feature really paid off. 1) The Staika's outer tent did not sag when wet. The fact that it was not necessary to adjust it was one of my deciding points and It has proven to be the case. 2) I am compelled to mention that there is an individual who has made a major effort to flood multiple internet Staika and Hilleberg vendor websites, forums, and YouTube postings complaining about Hilleberg not seam sealing the bathtub floor corner seams and not being happy with their fair response. I even noticed one reader expressing lost interest in purchasing one because of these remarks. I can tell you the Staika's corner seams are suspended over 3" above the ground and covered completely by the outer tent. I did a precautionary seam seal when I first bought the tent partly because of these remarks. But, I now know by wet weather observation and use it wasn't necessary. The outside of the floor seams of my Staika have remained dry, and I can't see how any water could seep through these unless perhaps It was pitched in pooled water more than 3" deep. February 2015: During a ski trip at Whiteface in the Adirondacks. Tent site Dry Bulb temps went down to 4 below the first night and somewhere around 0 the 2nd. This is actually fairly warm for February nights in the Adirondacks. About 3 inches of snow the 1st night and around a foot the second. I pitched the Staika on the two foot deep snow surface near a stream about 800' from the car. I dug a vestibule trench. I did not use a ground cloth and used the three season sleeping gear as described above. With long under wear and my Mont Bell Alpine Light down jacket, I was comfortable (albeit not toasty) and slept soundly both nights I believe even a space blanket under the Q Core would have helped because the coolness that penetrated my gear was through the sleeping pad. Obviously my old North Face 15 below mummy bag would have helped as well, but I really wanted to test the limits of the 20 degree bag. I had only one inner vent open on the first night, and did not vent the outer tent. By morning I had a small circle (size of a pie plate) of frozen condensation in the inner tent and strangely only in the far corner from my head about 1/2 way up the side. The outer tent had frozen condensation all around the inside walls. It is hard not to drag in a little bit of the snow in from the vestibule area, and I noticed that what I hadn't brushed out maintained its consistency through out the two nights. After a day of skiing and an evening of reckless abandon, I got back into the Staika for the second night. This time I opened both inner vents and opened the outer tent vents a few inches on each side. This must have helped for I did not notice any added buildup on either tent layer the next morning. I do not know if a using a ground cloth without the outer tent vents opened would have helped minimize the outer tent condensation in such severe cold. This was a great experience. The snow I slept on was like a memory foam mattress under the pad.The snow storm in particular on the second night was of the super fluffy sparkling type. And the rushing whisper of the built up snow on the tent canopy as it slid off the side of the tent almost in a side to side rotating fashion was entrancing. I have a great deal of respect for those who spend an extended amount of time in this kind of cold weather. I had it easy with the pub dinner/ music and libations and a chance to thaw out my core after a day of -15°F temperature on the slopes and before I crawled into Staika heaven. Spring/ Summer 2015: More adventure and two beautiful nights camping at Slide Brook while climbing the five mountains of the Dix Range in the Adirondacks. Check out the short video on YouTube: "Staika, Trangia, Spam Heaven". Perfect weather! Then? Two more nights to polish off Simmons of the Seward range. First night was perfect weather. Second night?—driving heavy downpours until about midnight. One vestibule was used for gear and my muddy wet clothes and boots, the other vestibule was for... "not getting out of tent all night." I believe many tents would have leaked in this weather, but with this tent no misting or leaking (anywhere!) and I believe the roof venting and canopy over the top has proven itself as a superior design. I did disconnect the inner tent and packed the wet outer into the back mesh pocket of my Osprey pack for the 5-mile hike out to the trail head the last morning. Next? Back to the Adirondacks two nights to climb the remote Allen mountain. First night at the Lower Twin Brook the forest was so thick and sloped that there appeared to be no place to pitch any tent. But, I found a lump of raised ground and after clearing away the enough branches to be able to pitch it, I had enough flat area the width and length of my sleeping pad. The rest of the tent was suspended in the air to where the points of the vestibules were suspended over a foot in the air. It would have been a perfect pitch for runoff water, but no rain that night, nor was there rain the second night where I pitched the Staika on a little cutout on the edge of an old lumber road by the Opalescent River. While setting up my site, I noticed an animal trail in the back of the clearing and I had actually took the precaution to build up a wedge barrier of dead sticks between the back of the tent and the trail just so nothing would barrel into the tent if it did come charging out.This left only about a foot of clearance on each side of the tent. Sure enough!!!! There was late night excitement when I was jolted out my sleep by a shaking tent as a pack of Coyote? Coy Wolf? charged into out of that little trail and right around the Staika. Their paws were banging the bottom edge of the outer tent side as they ran by. I had just turned on my flashlight in time to shine it on a snout that lifted up the front vestibule enough to flash me a very teethy grin as they charged by. This all happened within a couple of seconds. I also noted the next morning that the bear barrel which was about 150' up the lumber road had been kicked around that night as well. Summer 2016: The big hike into the Cliff, Redfield, and Marshall mountains to complete #43, 44, and 45 of my "46'r" objective. There was driving rain while I hiked all of the way to the Flowed Lands where I pitched the tent. Downpours through out the evening. The temperature was unusually warm for late May which would have been a saving grace except it brought heavy humidity which permeated everything. I was glad I had decided on the synthetic fill Marmot 50 degree bag rather than the down bag. The next day was still warm but the weather had cleared. After climbing Cliff and Redfield I moved my tent site to the base of Marshall on the return side of the Flowed Lands and had a beautiful dry evening the second night out which really gave everything a chance to dry out. As this is a tent review, lugging 7.5 lbs. of Staika around was admittedly occasionally thought about while lugging it to the remote areas I have carried it on these adventures. Most people probably bring their pack weight down over time, but mine was up to 35 lbs. on the two "nighters" as I evolved to bringing more prepared food and an extra tarp and a mandatory bear barrel for the High Peak areas. But, as I had originally settled on purchasing just one tent that I could use in all situations for a long time and when with use, you have had wild animals banging the side of it while they are charging by in the pitch black night, or while you spend hours roosting in it during the nights where the rain was terrible, I knew I couldn't have made a better pick. My only other suggestions to thrive while sleeping out in the remote Adirondack forest would be to have dry spare socks and shirt for sleeping and prepare and keep all of your food away from your tent as the weather is unpredictable and bears are a real issue up there. As I am no spring chicken (mid-fifties) I have been beaten up and driven to exhaustion by tackling the beautiful Adirondack mountains in the last couple of years, but never once was I hypothermic, hungry, or uncomfortable while in the tent or bag. April 2017: A one day trip up MT Colden last July completed my 46'r objective and I have joined the ranks of the Adirondack 46'rs. Now I look forward to the pleasure of many more nights in the Staika beyond the occasional backyard campout with new hiking and motorcycle oriented adventures worthy of this first class tent..as written in April of 2017. Welcome to Trailspace! Nice first review. Thanks for sharing your Hilleberg review, Forest. I hope you'll give us an update after your next trips. Thanks for sharing your updates, Forest. Congratulations on finishing the Adirondack 46ers, Forest Thing. Your grandchildren will be using this tent, it is that well made. NEVER a leak, even in torrential monsoon that forced others to abandon their Eureka and N. Face into the Staika. Built tough and it is a bit heavy because. Expensive for a reason, not China-built disposable like SO MANY others out there. Zippers abound and each has a purpose. Easy setup, even for one person. Built-in ground cloth is handy, but I use a larger one, in addition, to help preserve the factory one. Each tent is "signed" by the assembler (in Estonia, mine anyway). Extremely stable in high winds, driven snow, blasting sand, and rain. Very pleasant communications with the Hilleberg family. Welcome to Trailspace! Thanks for sharing this review. What do you mean the tent is "signed?" The person who assembled the tent sews in her name on a tag. As far as I know all Hillebergs are signed. I have two and they are both signed. The best tent makers in the world, however the tent I bought leaked and Hilleberg told me to fix it myself! Having just bought a Hilleberg Staika for £850 I noticed that my bathtub floor corner seams were not sealed so I poured in some water and guess what, it ran straight out through the seams. When I looked closely I could even see daylight through some stitch holes. I sent an email to Hilleberg about it and got the reply "yes, we know they leak but can send you some seam sealant to use." I was staggered that possibly the most expensive tent in the world had such a major design fault and it had not been fixed by the manufacture. Needless to say I fired off a reply saying the same, but never got a reply, so I took the tent back to the shop and got my money back. While there we checked all the other Hilleberg models in the shop and they all leaked. The other makes of tent we checked all had fully taped seams and none of them leaked. I've since emailed the MD of the company, but to date have not had a reply — very, very poor customer service.